Last March I visited Iran and was impressed about the way women declare their freedom against compulsory hijab….please have a look to the lady´s coat on the right…. 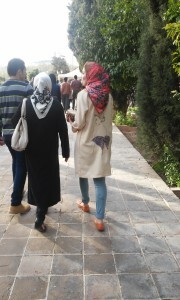 This picture was taken in the Eram garden in Shiraz, by the end of March, at Nowruz festivity, the Iranian new Year. Although I can not be sure about the lady´s intention wearing this design, the least I can say is that it looked really courageous and provocative in that scenario…….If you want to support women´s right to take off their scarfs in Iran you can follow: #My Stealthy Freedom. And let me recommend you an interesting novel that reflects the situation of women in Iran: “El libro de mi destino” (in the Spanish version) by Parinoush Saniee.